Veteran DeSoto police officer Nick “Corporal Nick” Bristow (far right) will be WFAA8’s new early morning traffic reporter. 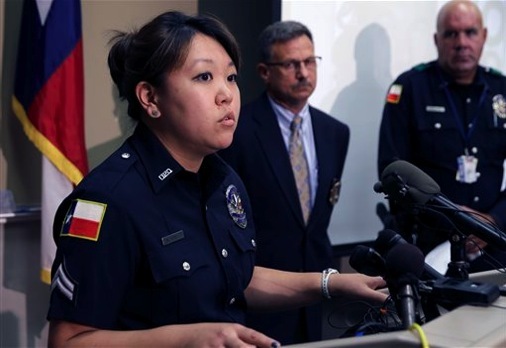 He’s shown here in an August 2013 AP photo from a news conference on the fatal shootings of four people in two separate North Texas homes. WFAA8 news director Carolyn Mungo won’t comment, and the station also has since pulled down two “Corporal Nick” audition videos that were posted on youtube and embedded Sunday on unclebarky.com. But several sources confirm that veteran DeSoto police officer Nick Bristow, referred to only as “Corporal Nick” in WFAA8 rehearsals with Daybreak co-anchor Alexa Conomos, has won the job to succeed Shane Allen as the program’s weekday early morning traffic reporter. We try to stay ahead of the curve, so to speak, even though WFAA8 management has done its best to put up barricades. Bristow’s start date is not yet known. But he’s continued to rehearse this week at WFAA8’s Victory Park studios for his debut as the D-FW market’s first uniformed traffic reporter. Bristow had a bit of a bumpy ride in his nuts-and-bolts traffic trouble spots audition but came off as an amiable regular guy in a second Q&A tape with Conomos. He’ll celebrate his 20th anniversary with the DeSoto police force in November, Bristow said. He also is the father of three sons, including 15-year-old twins, and occasionally moonlights as an Elvis impersonator. He performed a few bars of “Suspicious Minds” for Conomos. But Bristow has no previous television experience. San Antonio’s KSAT-TV uses two uniformed cops for its early morning traffic reports. Its slogan is “Real Officers. Real Experience. Real Traffic Reports.” WFAA8 soon will be taking this same U-turn after dropping Allen on Aug. 1st. In his subsequent Facebook post, Allen cited the station’s intention to move in a “different direction.” Indeed. No. 1-rated Fox4’s Good Day, No. 2 NBC5 and No. 4 CBS11 all use civilians as traffic reporters. Chip Waggoner is Fox4’s principal roads scholar while NBC5 and CBS11 respectively feature Samantha Davies and Whitney Drolen. None have ever been with law enforcement but all know how to drive.